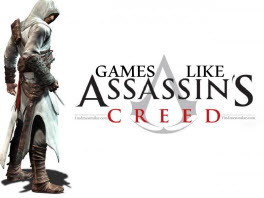 25 Games Like Assassin's Creed (series) '+g+"
Assassin's Creed is a series of historical action-adventure games with a heavy emphasis on stealth, combat, and free-running. The game is presented in a third-person perspective which takes place in 2012,and follows the path of Desmond Miles as he uses the Animus to relive the memories of his Assassin ancestors while protecting them from the Knight Templar's. If you are a fan of action-adventure stealth games like Assassin's Creed and looking for more games with similar gameplay then find the recommendations for it below and don't forget to mention if we miss any games as we keep on updating this list. Batman: Arkham City is an action-adventure game developed by Rocksteady and published by Warner Bros based on the DC Comics character Batman. It is the sequel to the 2009 video game Batman: Arkham Asylum and is set one year after the events of Arkham Asylum. Play as the dark knight as he battles through Arkham City, the maximum security home of all the villains that Gotham has to offer. Prince of Persia is an action adventure video game series created by Jordan Mechner in 1989. The games in this series focuses on various incarnations of the eponymous prince. The first two games in the series were 2D platformers however the producers made the switch to 3D in 1999. Thief is a series of action-adventure stealth video games. The games in this series are often described a first-person sneaker games where players take control of Garrett, master thief in a large fantasy/steampunk metropolis simply known as "the City". Dishonored is an action-adventure game played from a first-person perspective with an emphasis on stealth action. The game is set in the fictional, plague-ridden industrial city of Dunwall which follows Corvo loyal bodyguard of Empress is falsely accused of her murder, is left for dead. With the help of empire loyalists Corvo escapes from the prison seeking revenge on those who have murdered his charge. Tom Clancy's Splinter Cell is a series of action-adventure stealth video games developed and published by Ubisoft Shanghai, and Ubisoft Montreal. The gameplay in the series is primerly based on stealth and follows the activities of National Security Agency's stealth-mission expert named Sam Fisher who must finish his objectives as covertly as possible. Deus Ex: Human Revolution,......if you can think of more, then don't forget to mention it in comments.